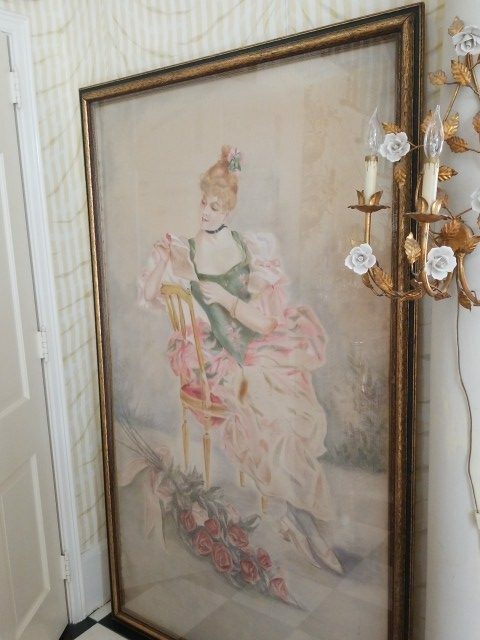 Gorgeous Mademoiselle Matinee Style Antique Painting on canvas placed behind glass and framed..the grandeur of this painting is absolutely breathtaking with an early 1900’s to late 1800’s depiction of a Pretty Mademoiselle with auburn red hair dressed in her finery. 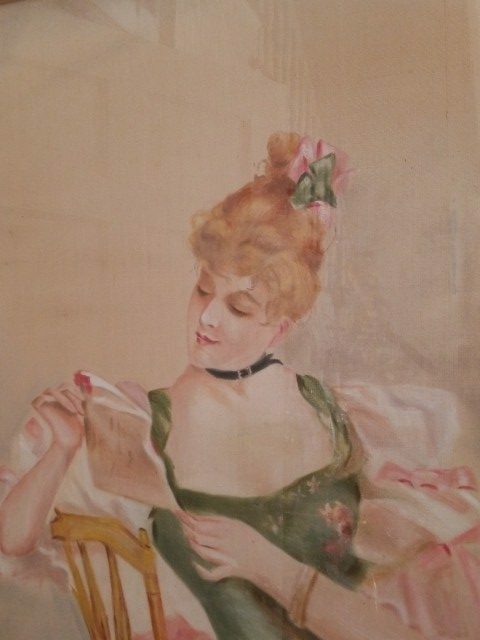 It appears that she is delicately sitting in her French Style chair while reading a love letter with a bouquet of long stem pink roses resting at her slippered feet. 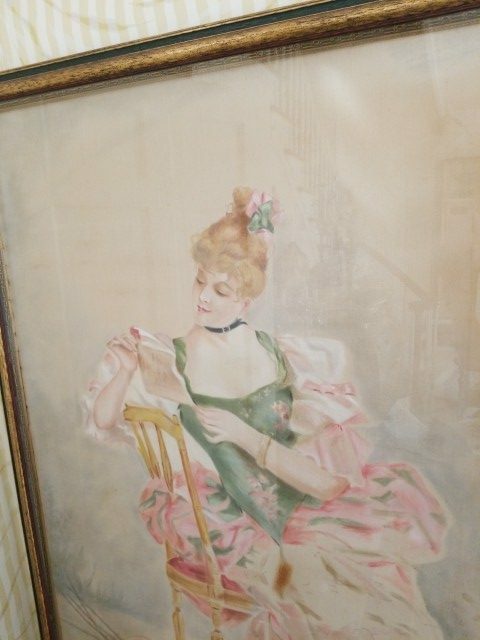 The colors in this painting are lush pastel hues in tones of pinks, greens, beiges, and soft green. The background is painted in muted tones of beige, gray, and slight hints of soft blue. Her skin tone is a soft fair pink with unbelievably realistic beige highlights. She wears a thin black choker as was characteristic for many lovely maidens during her time. I do not know who the artist was because I can find no signature but his or her work is exquisite! The back of the canvas is open and stretched on old wood and I have tried to show in my photos. 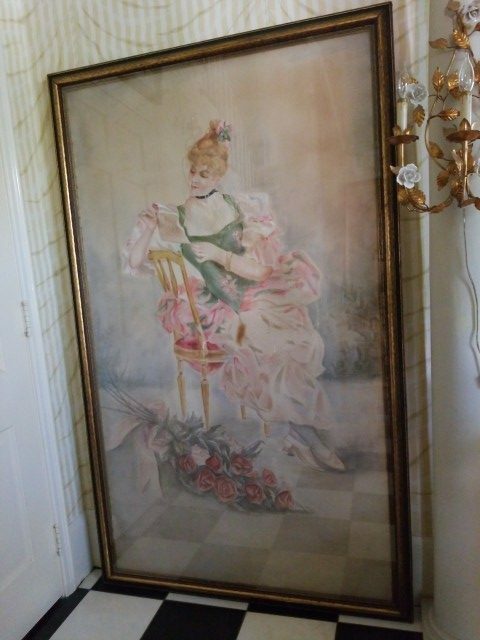 I believe this to be an oil on canvas but it possibly could be pastel. 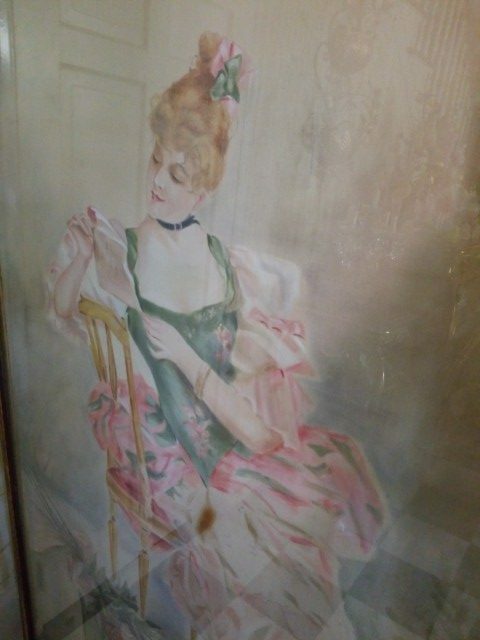 The canvas is not as thick as many that I have had but it is not silk and has a substantial weight. 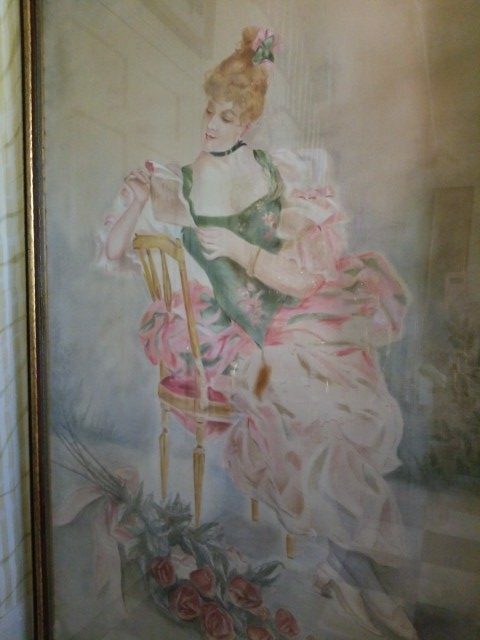 I do know that it is one old and very beautiful painting! 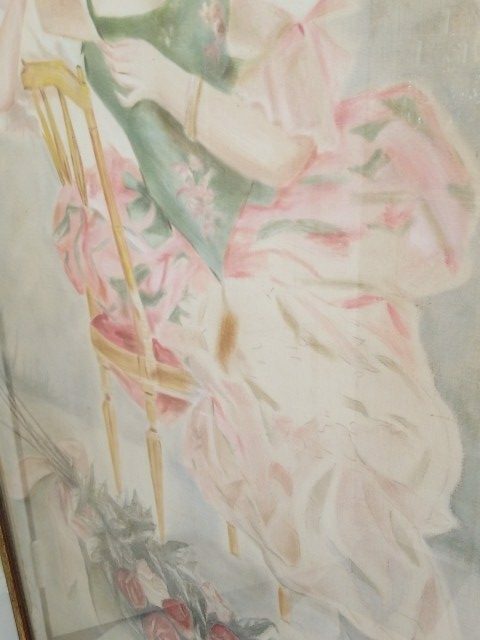 There is a small rip in the upper right area of the canvas which could easily be repaired but it is not noticeable except up close and in no way distracts from her beauty!! There is an area on the back of the canvas that looks like a small repair might have been made but I cannot see any corresponding area where that could have been. It may just be gesso dried on the back? 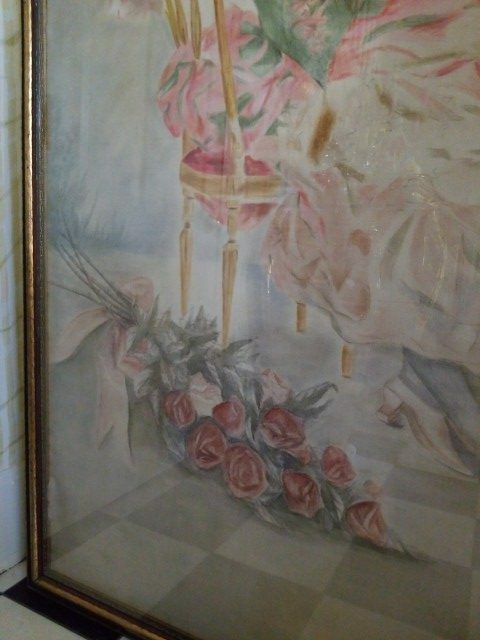 See my photo.The painting is behind glass and the wood frame appears to be a thin frame within a frame. There are new small wood bracket areas on the back holding the 2 frames together and from the sides you can see where some silicon has been applied to secure. 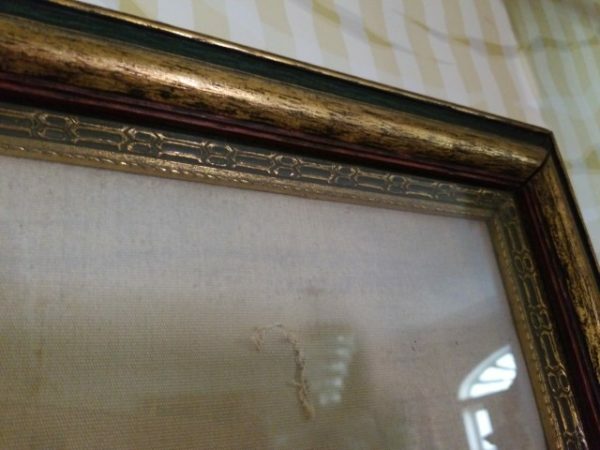 The frame is very nice being wood antiqued in a smokey black green tint with mainly golden highlights and the inside frame has a lovely etched with small rope edge. 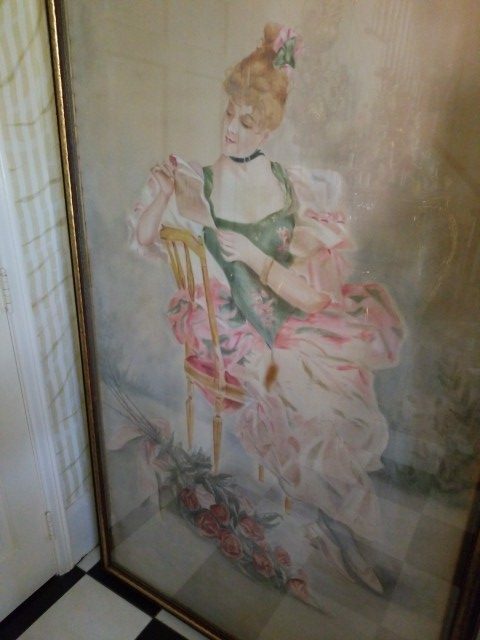 The outermost edge on the left of the painting is not totally under the frame. 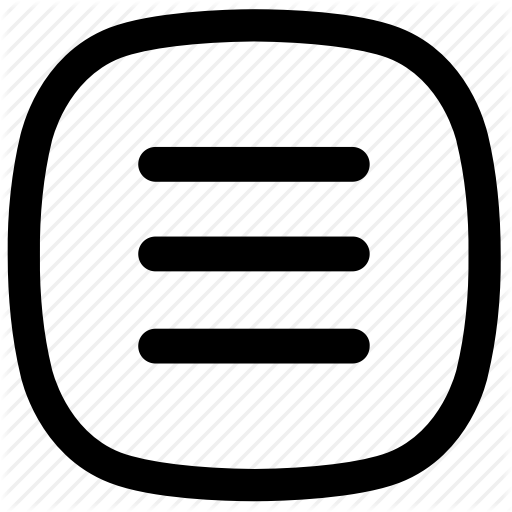 It is not extremely noticeable but it appears that the canvas itself has pulled away from some of the small nails on both sides at the back. The canvas is still flat and shows well overall. 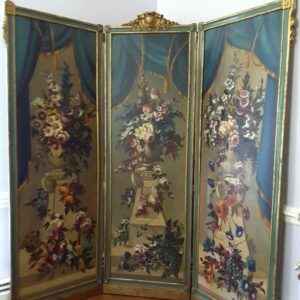 I believe the painting to be older than the outer frame but perhaps the thin inner frame was original. Drop Dead Gorgeous as is or take her out of this frame and create your own Romantic Architectural frame!! Price Does Not include shipping. Please contact me for a shipping cost if you are not able to pick up the item.